Billions of dollars are being spent around the world on adapting our cities to climate change. Unfortunately, most of the planning to this point does not include the specific intention of making space for biodiversity. This is a lost opportunity for conservation and the resilience of our cities. 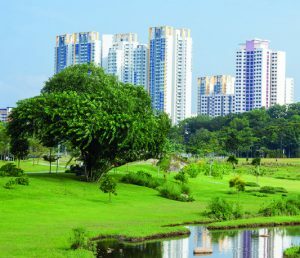 There is now considerable evidence of the many values of bringing biodiversity into our urban spaces, as well as the creation of many strategies on how it might be achieved. 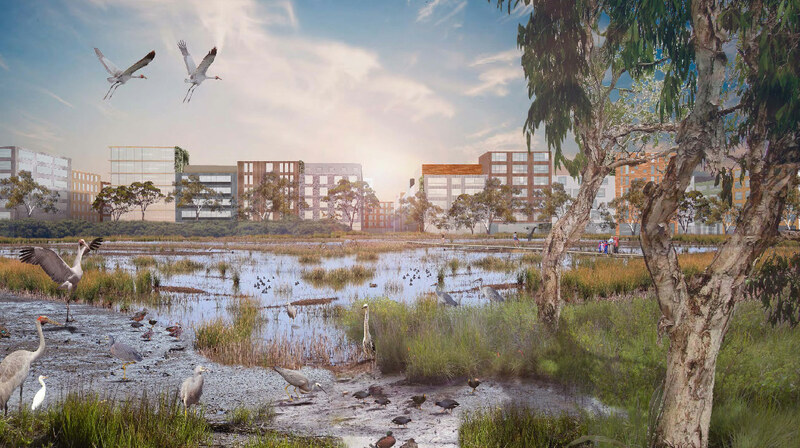 Pictured above is one depiction of how biodiversity might be incorporated around the urban development at Fisherman’s Bend near Melbourne. It’s part of the work being done by researchers at RMIT under the theme of Biodiversity Sensitive Urban Design. See https://iconscience.org/biodiversity-sensitive-urban-design/ for details. We analysed 80 city climate-adaptation plans and found that urban greening plays a key role in most adaptation strategies. This represents an enormous opportunity for biodiversity conservation. Unfortunately, our analysis of these 80 adaptation plans (of a total 151 found globally) shows that this opportunity is being missed. Just 18% of the plans assessed contained specific intentions to promote biodiversity. Over half of the world’s people live in cities, and this will reach two-thirds by 2050. Most cities are situated on coasts or rivers, and currently more than 400 cities across the world are directly threatened by sea level rise, putting more than 400 million people at risk. Cities are therefore right at the frontline of climate change, as they are already being impacted in many places. Because of this, they are leading the way in implementing adaptation strategies, to the tune of billions of dollars. These often involve large-scale environmental management, such as tree planting and sea walls, and can mean changes in infrastructure. Some of these can have negative impacts for biodiversity, and others can be beneficial, but in most cases, the impacts on biodiversity are accidental as it is not considered in the adaptation planning process. Because of their greenhouse gas emissions, cities make an enormous contribution to climate change. However, because cities have considerable wealth and resources, they are also in a position to actively respond to climate-change threats. Around the world it’s been estimated there are some 1.7 million adaptation measures currently ongoing. Many actions, such as catchment afforestation, street tree planting, and additional green space provision, will not only reduce human exposure to climate hazards, but can also be beneficial for biodiversity and conservation. This is especially important as urbanisation and the growth of cities is one of the most dramatic forms of land transformations, leading to the fragmentation, degradation and removal of natural habitat. Cities can contain high levels of biodiversity and include important ecosystems for endangered species. 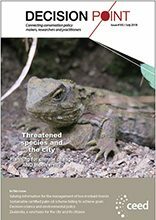 Indeed, many cities and their associated urban areas can provide important opportunities for the conservation of threatened species. Adaptation planning for climate change is a unique opportunity to integrate proactive planning for biodiversity into urban landscapes. Globally, the ranges of at least 270 threatened species overlap with the area covered by just 58 city adaptation plans, including watershed catchments across more than 28 million km2. Including biodiversity in adaptation planning could thus have a significant positive impact, but the opportunity is largely being missed: fewer than 20% of plans specifically incorporate biodiversity. Some planned adaptation actions are substantial and may have even a bigger effect on urban biodiversity than the direct impacts of climate change. However, the opportunities and threats associated with these effects are not well understood. For example, the regeneration of vegetation to improve local climate (to help reduce the urban heat island effect and provide climate stability), could at the same time provide increased habitat for woodland species. Similarly, protecting urban watersheds (to support urban water supply), will promote ecosystem intactness, enhance freshwater habitats and help maintain species community composition. These actions could therefore mitigate many of the negative effects of urbanisation, including degradation and loss of habitat. In addition to directly benefiting biodiversity in cities, explicitly including conservation planning could help countries achieve their Aichi biodiversity targets. For example, Amsterdam, in the Netherlands, has a specific biodiversity climate change adaptation plan to increase and enlarge protected areas, to promote resilience to extreme weather events, and increase connectivity, to foster species dispersal and migration. This demonstrates how the two processes of climate adaptation and biodiversity conservation can work together. And this is where we come in – conservation planners should be involved in the planning of a city’s adaptation strategy for climate change with the goals of: maximising biodiversity gains where possible; minimising the impacts on existing biodiversity; maintaining habitat for rare and endangered species; minimising damage to ecosystems, and; identifying areas of high conservation value that could potentially provide the ecosystem services upon which people in cities rely. The Green Climate Fund of the UNFCCC is in place to support countries, particularly developing countries, in creating climate compatible cities. These cities are where urban population growth is forecast to expand the most. 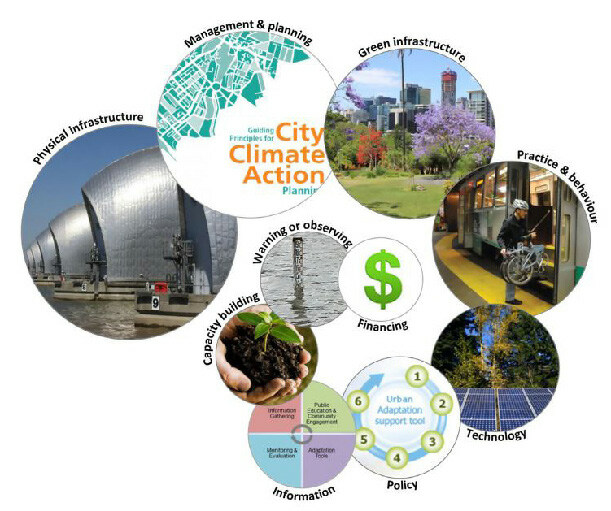 This is an extraordinary opportunity for conservation scientists to engage in adaptation planning and promote novel strategies to both support the sustainable development of the cities while maximising benefits for biodiversity.